It’s hard for me to write a review of Thin Ice because I’m not familiar with the genre, and haven’t read a book like it in years. I’ll just stick to my thoughts while reading it, and hope that it gives you an idea of what the book is like. Mik has a Snake inside him with wrong-way scales. They grate against his insides when he sees his father passed out from liquor again, when his older brother leaves to go sleep at a friend’s house, when he has to tell his friend Ploppy that no, they can’t play at Mik’s house. Thin Ice is the story of Mik trying to find a home. There are two things that influence the writing in this book. 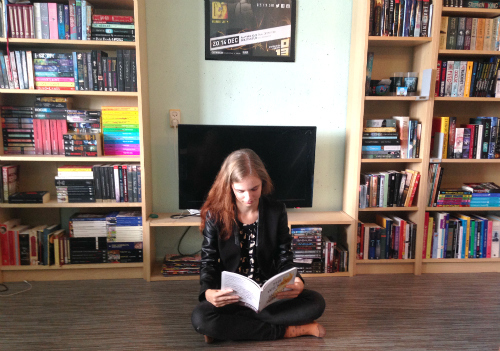 First, Thin Ice is a translated work. That means sometimes a joke will sound better in Swedish than it does in English, and sometimes a sentence will come across a bit choppy. I’m used to reading works in translation myself, but for someone that has read original English for their entire life it might feel different. Secondly, Thin Ice is a children’s book. It has short sentences and short scenes, that make them readable for kids that don’t have that high a reading level yet. If you’re used to the flowery adult kind of writing, it might seem extra choppy and short to you. Personally I thought the writing in Thin Ice was a perfect fit for the book. The descriptions were endearing and sounded exactly like a child would make them. It added a realistic atmosphere and prevented the book from turning preachy or condescending. Mik’s situation is often bleak and horrifying. He doesn’t have an easy life at all, and it rubs off on him. The way Thin Ice is written made me connect with him and feel for him. 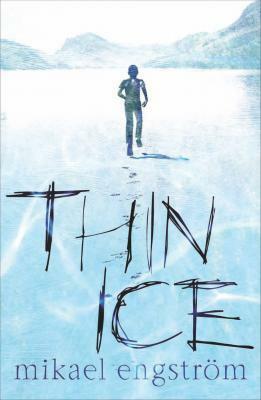 Sometimes nerve-wrecking and constantly engaging, I very much enjoyed Thin Ice. The author kept us in suspense whether or not Mik would find a safe and loving home until the very end. Thin Ice is a lovely contemporary book about issues as alcoholism, abuse and the foster system, without it being depressing or offensive. Mr Engström handles all sensitive subject in an honest but non-graphic way. I think children will enjoy Mik’s adventures as well as adults. Where would you rather live, in a lonely flat with your drunken father, only bearable when your big brother is home? Or in a small, snowy village with a frozen lake, where your aunt burns books to keep warm and a girl called Pi makes your heart beat a bit too fast.